Marking transactions as a transfer identify transfers in the transaction list with the transfer icon and can be used as criteria within the transactions search. Transactions belonging to a transfer category will be marked as a transfer. PocketSmith will also try to automatically identify transfer transactions and mark these as transfers for you. Also, you can manually mark transactions as transfers. All transactions assigned to your transfer category will be marked as transfers and displayed with the transfer icon so they are easy to recognize around your PocketSmith account. Transfer transactions like this will be removed from the Earning and Spending chart on your Dashboard, the Digest page, and the Income & Expense statement. They will also be excluded, by default, from totals on the Budget Summary (at the top of the Budget page), as well as the overall figure on the Trends page. 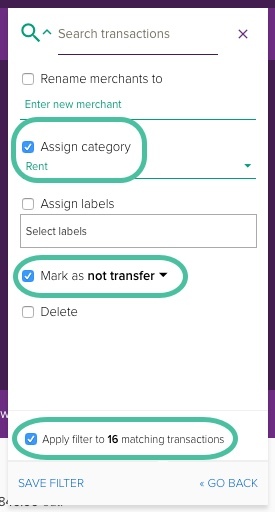 When you create a transfer category, this will mark any new transactions assigned to this category as a transfer, however, it won't mark as a transfer any existing transactions assigned to this category. In order to mark the existing transactions as transfers at this time of changing the category to a transfer category, you will need to select the following option that will become available to you Mark transactions already assigned to this category as transfers. If you want to remove a transfer category so that it is a regular income or expense category, this can be done by editing the category and de-selecting the option This is a transfer category. Following this, you'll be given the additional option Unmark transactions already assigned to this category to no longer be transfers. 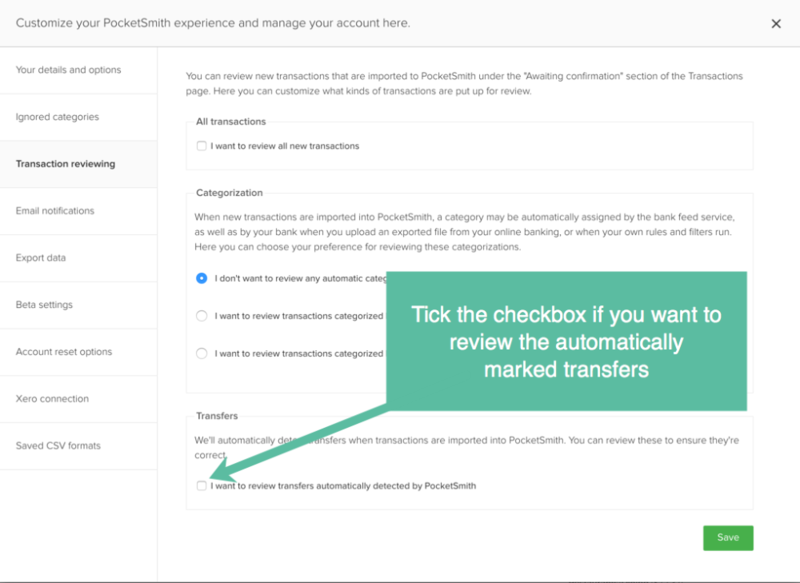 It's important to consider this option because if it is left unchecked, all transactions within the category will still be marked as transfers. Automatic transfer marking analyzes your transactions to find and mark both the income and expense transactions that match a transfer between accounts, regardless of whether these transactions have been assigned to a transfer category. This is based on a complex matching rule that compares the amounts, dates, merchant names and accounts of the transactions. For example, a $100 credit transaction occurring on January 5th in one of your accounts, will likely be matched with a $100 debit transaction occurring on January 4th in another of your accounts. Both transactions will then be automatically marked as a transfer. It isn't currently possible to turn this off from within PocketSmith but we are planning to add this in the future. In the meantime, if you would like to turn off automatic transfer marking, please get in touch and we'll make this change for you. Turning off this feature will not stop transfer marking of transactions that are assigned to transfer categories. This will only stop PocketSmith from detecting and marking additional transfer transactions that may not already be assigned to transfer categories. PocketSmith won't mark transactions as transfers if it finds conflicting transactions. Transfers are seen as conflicted when there is more than one possible match for a given transaction. For example, if you had two expense transactions within a day or so of each other, and one income transaction on the same day, PocketSmith might not be able to determine confidently which of the expense transactions should be associated with the income transaction. PocketSmith will attempt to resolve these conflicts through inspecting merchant descriptions and stored account numbers. If PocketSmith cannot resolve these conflicts through these means, then it'll err on the side of caution and leave the transactions unmarked as transfers. A way to resolve these conflicts manually is to search for possible transfers on the Transactions page. Just head to the Transactions page, use the Tools menu, and choose Possible transfers. This will show all possible transfers based on a simpler matching algorithm, and lets you quickly track down transactions that were considered conflicted when they were imported. You can review transactions that have been automatically marked as transfers on the Awaiting confirmation section of the Transactions page. If you have any transactions you'd like to unmark as a transfer you can do this here. Your transaction review settings allow you to choose whether you'd like to review these types of transactions. If some of your transactions have been incorrectly marked with the transfer icon, and don't have a matching credit or debit transaction in another account, this is likely caused by automatic categorization from the bank feed. If you have automatic categorization from the bank feed turned on, when your transactions are first imported into PocketSmith they are initially assigned to a rudimentary category before any category rules and filters (if any) are applied. If you use category rules or filters, then in most cases, you won't notice any incorrect assignment by our bank feed provider because your category rules or filters will correctly reassign your transactions to your preferred category. However, when a transaction is assigned by automatic categorization from the bank feed to a transfer category, this transaction is simultaneously marked with the transfer icon. Then, if that same transaction is run against your filters and category rules and reassigned to a different (non-transfer) category, that transaction won't have the transfer icon removed during this process. To make sure that affected transactions have the transfer icon removed if they are reassigned from a bank feed category to a non-transfer category, you can create a filter that assigns transactions to the desired category while also removing the transfer icon. If you'd like to remove the transfer icon from any previously affected transactions be sure to choose Apply the filter to any matching transactions.